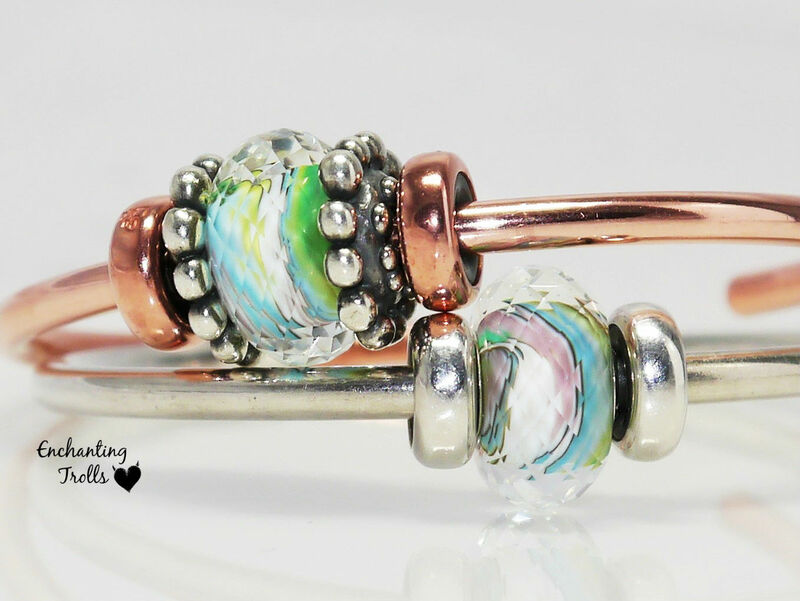 This post brings live photos and a review of this year’s Trollbeads Day bead. I was hoping to get this out yesterday, but due to things being hectic at home at the minute it was midnight before I got all my photos done. Most of my readers will already have seen stock images at least of the bead, and no doubt many of you already own one (or more!). Nevertheless, it is always nice to see live photos! 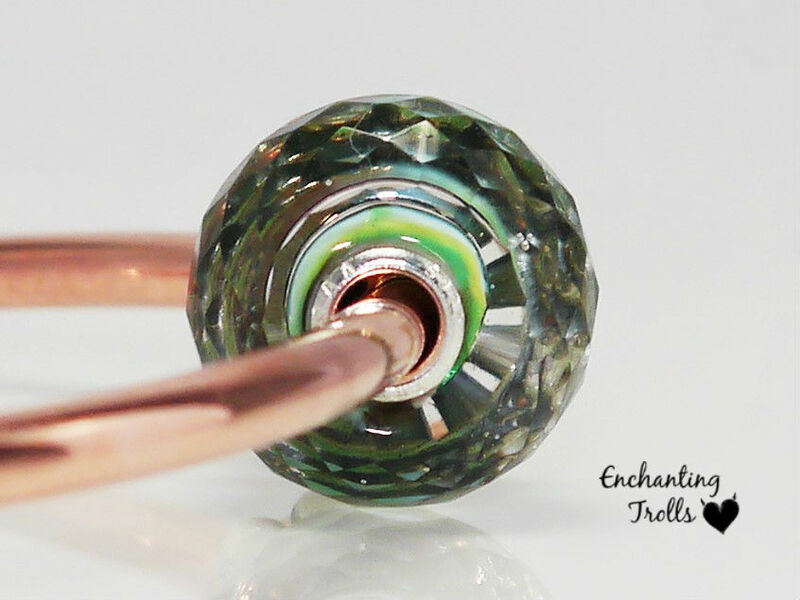 This year the bead is a faceted glass bead, with swirls of light green, darker green, lavender, blue and white. This eclectic colour mix lends itself to a multitude of bracelet themes and colour palettes. It fits in perfectly with the current bohemian trends. From the beads that I have seen so far, there is a good degree of variation in the colours, in terms of how much of each colour is visible, and all are equally as attractive. I love how in the above photo the patterning in the two beads appears to join in to one and flow between the beads. Some people were apprehensive as to the bead being engraved with the year, and how visible this would be. The year is engraved on the core, the same side as the hallmarks LAA and 925S, and not on the glass as some initially thought (this would have been hard to achieve with the bead being faceted). I did try to take a side photo of the bead, but it didn’t come out as I hoped, s I will get another one done but this gives an idea of where the engraving is. I have a blouse with a design of peacock feathers but in pastel colours, and this bead matches perfectly. 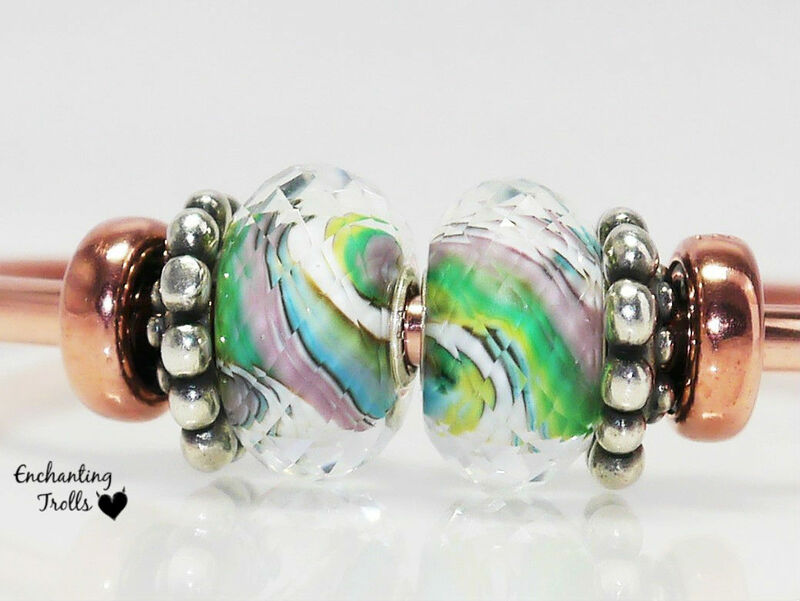 It really is such a pretty bead. 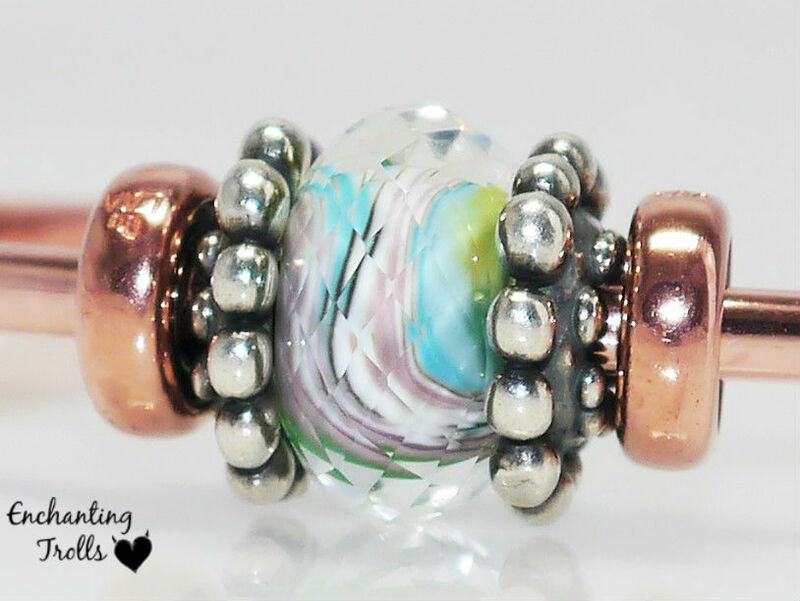 It will work equally well with mythical or more contemporary designs and I think it looks great with the Trollbeads Day 2014 silver bead! 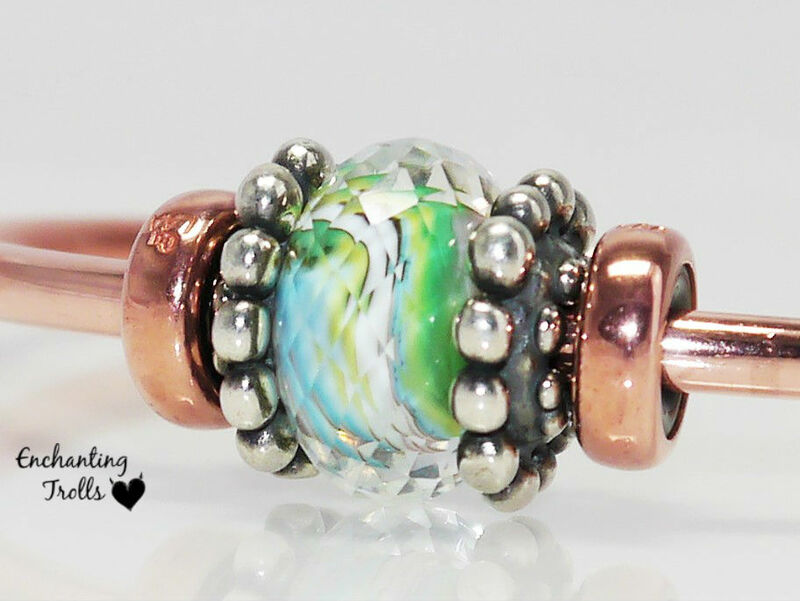 The bead looks great on both the silver and copper bangles … a great focal bead! 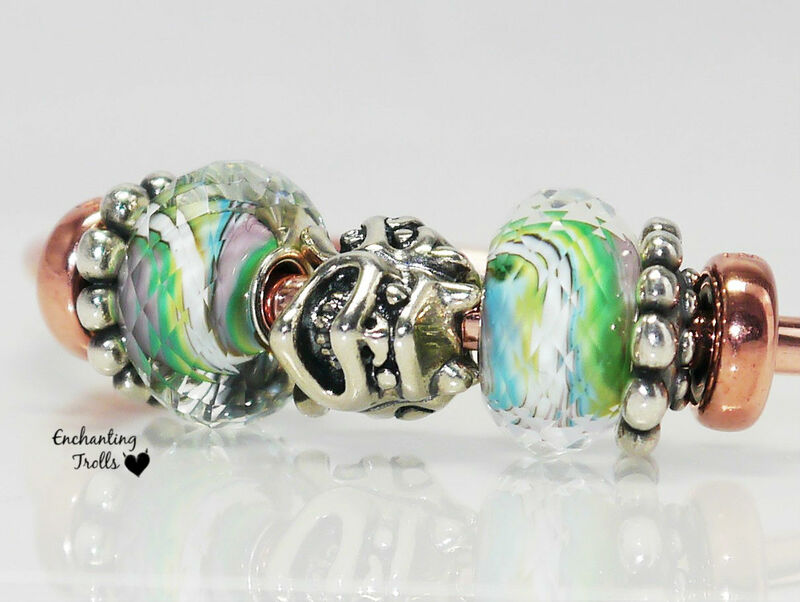 Last year’s Trollbeads Day bead was met with a mixed reaction, the design was very much reminiscent of earlier Trollbeads style and was well received by long term collectors. However I appreciate it was not to everyone’s taste. This year’s bead is just so pretty though and I cannot see anything not to like about it. I love to hear what my readers think of this year’s bead. Is it different from what you were expecting? Did you succumb to buying one … or two … or more?! Do you think the Snapchat teaser images were good clues?? I didn’t get one, but wanted to say that your photos are gorgeous! Hi Martha, thank you for the lovely comment 🙂 I am super excited for next year’s Trollbeads Day as it will be Trollbeads 40th Anniversary!